My presentation is on: Vijnana in the Works of Swami Vivekananda and Sri Aurobindo: Two Comparable Models. Most people in this audience know the work on Integral Yoga of Sri Aurobindo, whose model is having considerable impact on Western understanding of the full range of consciousness. Fewer, I think, know of the life and work of Swami Vivekananda, senior to Sri Aurobindo by nine years, and the teacher of what I term Integral Vedanta. Even less do they know the model of consciousness his work demonstrates, and which he learned from Sri Ramakrishna. The Integral Vedanta model is the outcome of the five year interaction between Ramakrishna and Vivekananda, who respectively represented Indian experiential shamanism and the acme of modern Western conceptualism—a dichotomous pair if there ever was one. 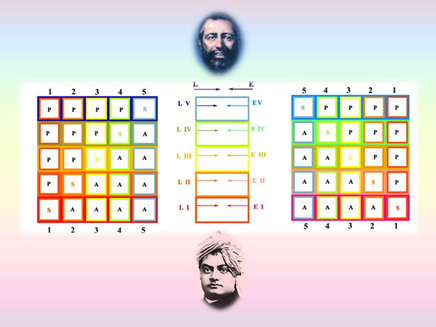 This model was created purely from the massive data available about the transformation of Vivekananda by Ramakrishna as well as Vivekananda’s subsequent reproduction of the model in his teaching work in both India and the West. Debashish Banerji’s Seven Quartets of Becoming helped me flesh out and understand more fully the systematism in the work of Sri Aurobindo (another Indian who spent his life reconciling the dichotomous relationship between India and the West) and afforded me the opportunity to compare it in some detail with the model I had developed for Integral Vedanta. Remember also that we derive from Ramakrishna. For myself it was Ramakrishna who personally came & first turned me to this Yoga. Then there is the incident of the personality of Vivekananda visiting me in jail. He explained to me in detail the work of the Supramental—not exactly of the Supramental, but of the intuitivized mind, the mind as it is organized by the Supramental [vijnana]. He did not use the word “Supermind”. I gave this name afterwards. I had no idea about things of the Higher Consciousness. I never expected [Vivekananda] and yet he came to teach me. And he was exact and precise even in the minutest details. . .
For me this testimony makes it possible to grasp why the models of Integral Vedanta and Integral Yoga have so much in common. I will now present those commonalities. In this rather formidable slide I present the structure and content of these two ontologies. At the bottom is the flaming red activity of Prakriti which sheds its multifold reflection far and wide and at the top a purple circle representing Purusha, the self-contained unity, stillness, and integration of the whole continuum. The stages of the Upanishadic and Integral models between and including Prakriti and Purusha—which we may think of as the stages of Al s purushartha—are represented by the six-fold color progression red to purple in the artists’ spectrum. In the center are symbols that express at every level the degree of resolution of dichotomy, whether of Purusha and Prakriti, subject and object, liberation and enjoyment, concept and experience. On the left I have Integral Vedanta and on the right Integral Yoga. In the case of Integral Vedanta the sources are the four contexts in the Mandukya Upanishad, to which is added the Tantric concept of turiyatita, beyond the fourth. In Integral Yoga Aurobindo chose to work with the fivefold context of the Taittiriya Upanishad. At each level I show these sources and their nomenclature and will relate them to the contemporary ontologies built upon them. I shall work from Integral Vedanta to Integral Yoga on every level. Spiritual Humanism and gets to brass tacks as to its pragmatic implications. 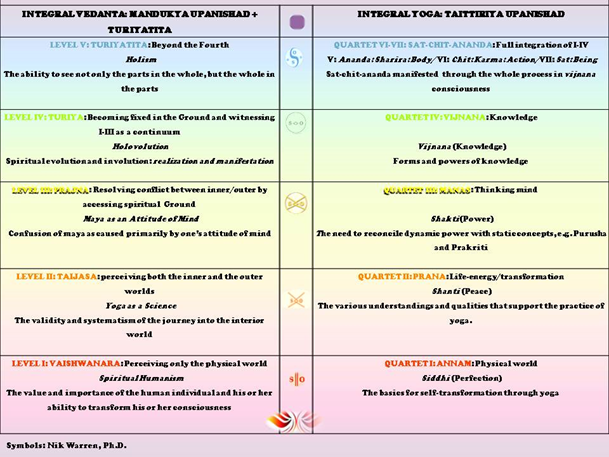 Level II is related to perceiving both the inner and the outer worlds and life-energy/transformation, both of which indicatean activation and transformation of the materialistic plane and find expression in Integral Vedanta as Yoga as a science, the validity and systematism of the journey into the interior world; and in Quartet II as Shanti (Peace): The various systematized understandings and qualities that support the practice of yoga. Level III is related to: Resolving conflict between inner/outer by accessing spiritual Ground and Quartet III to the Thinking mind, entries that express the kind ofdichotomous difficulties the human mind creates and has to face in progressing along the purusharthic pathway. In response, Integral Vedanta comes up with the confusion of maya as caused primarily by one’s attitude of mind, a humanist take on the traditional knotty metaphysical problem of maya. Integral Yoga focuses on Shakti (Power) the methods to reconcile dynamic power with static concepts, e.g. Prakriti and Purusha, object/subject, etc. In both models this understanding is brought about by the direct experience of Shakti or Cosmic Energy, conceived of as a feminine Power. Level IV relates to Becoming: fixed in the Ground and witnessing I-III as a continuum, and Quartet IV to Knowledge of a type that permits such vision, namely vijnana. 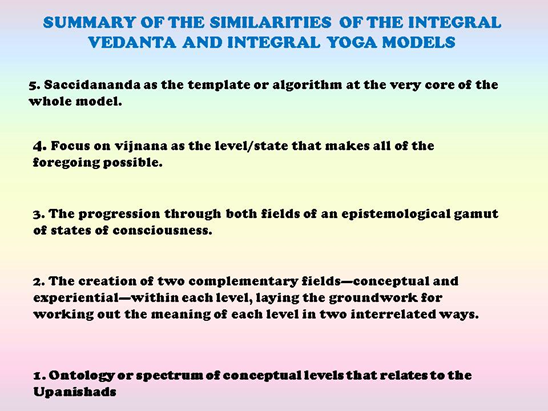 Integral Vedanta expresses this insight as Holovolution: combined spiritual evolution and involution: realization and manifestation, balanced by Integral Yoga’s Forms and powers of knowledge, that ranges over all of the recognized types of knowledge in Vedanta and also how they are expressed externally as supernormal, life and world-changing powers and insights. Finally, Level V gives us Beyond the Fourth and Quartet V: Ananda: Full integration of the contents of Quartets I-IV. In this fifth level or beyond the fourth,Integral Vedanta presents Holism, the ability to see not only the parts in the whole, but the whole in the parts—which is, of course, another way of expressing the notion of integral. On the Integral Yoga side, we find a full array of body, action and being, all transformed through integral or holistic vision. 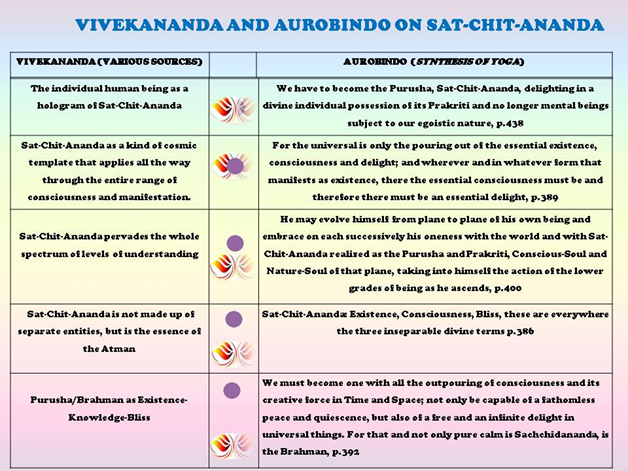 Aurobindo phrases it as Sat-chit-ananda manifested through the whole process in vijnana consciousness. This has been a rather schematic account of highly complex and very voluminous material, but I hope that it has conveyed the similarity of the Integral Vedanta and Integral Yoga approaches. I would suggest that Vivekananda’s work provides us with overarching principles that Aurobindo’s work explores in pragmatic detail. 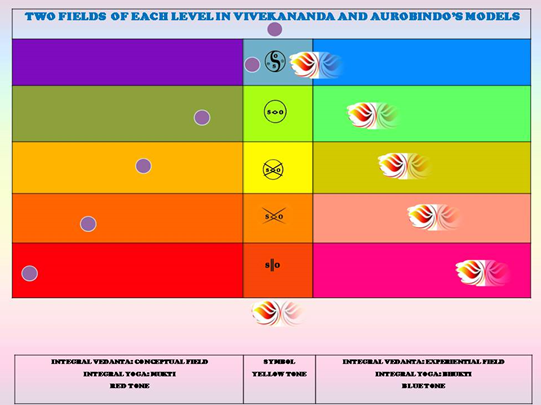 A second feature of the ontologies of Vivekananda and Aurobindo is that each level is expressed in two ways: In Integral Vedanta in what I termed conceptual and experiential modes and in Integral Yoga mukti or liberation and bhukti or experience and enjoyment. To my mind, these are nothing less than analogs of Purusha (concept/liberation) and Prakriti (experience/enjoyment) expressing themselves this time within the limitations of the levels of the ontology. This slide represents at the center the ontological core, on the left the conceptual side and on the right the experiential side. On each level the color is the same all the way over, but it takes on a different tone in each of the three columns, e.g. in the basically red color of Level I the central column has a yellow tone, while the conceptual column takes on a red tone and the experiential a blue tone. This convention carries on up the whole range of levels and represents in terms of color the connection between concept, the ontological core and experience in the range of red-yellow-blue, the range of the three primary colors in the artists’ spectrum. It also suggests a horizontal mechanism that relates conceptual context to experiential content through the ontological core itself. This could be considered the representation of a horizontal resolution of the Purusha/Prakriti or conceptual/experiential dichotomy. 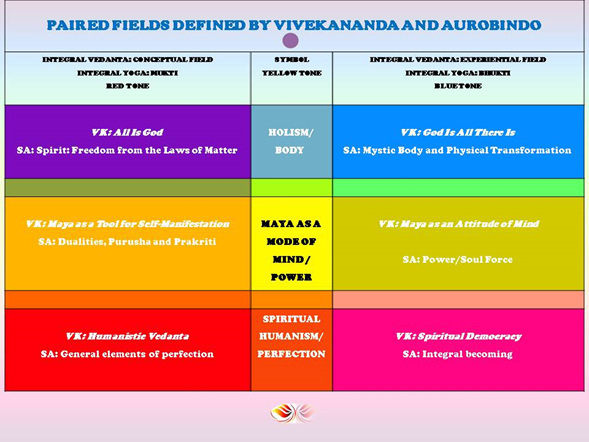 Here we have the headings for the two fields that I worked out from the Integral Vedantic data and Aurobindo created by himself. There is time only to comment on Level I where Vivekananda posits within the conceptual side of Spiritual Humanism Humanistic Vedanta, a kind of manifesto for India to put Vedanta into a framework that validates the human individual. 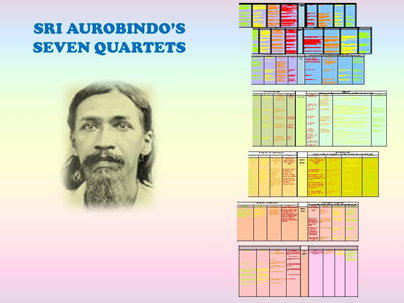 At the same position Aurobindo presents the general elements of perfection, a listing of the various Indian traditions behind the individual aspiring to transformation. On the experiential side Vivekananda speaks of spiritual democracy, the “experiential space” essential to the development of spiritual humanism in the West. Sri Aurobindo gives us here integral becoming, that refers to his whole integral system in terms of experience, enjoyment, joy. To my mind, this may be the most original aspect of the Integral picture: looking at two complementary sides of the picture at any given juncture and working on how to resolve the complementarity between them. It contrasts with traditional Sankhya and Vedanta that vehemently stressed the irreducible complementarity of conceptualism and experientialism, as more or less did Tantra. It also contrasts with the rigid conceptualism that dominates Abrahamic understanding of consciousness in the West and seems to have led to the ferocious suppression of mystical or experiential movements throughout Western history. Putting the resolution of millennial separation of the conceptual and experiential aspects of the human psyche at the center of its model, Integral is in a way moving to a whole new concept of what it is to be human and opening the door to infinite resolutions and unheard-of reconciliations. We can see this in the phenomenon of Vivekananda’s work, which conveyed to India the conceptual side of his own training, no doubt to help the Indians digest and organize their fantastically varied and diverse traditions based largely on experience. In the West he conveyed the experiential side of his training most likely to inject into the rather rigid conceptual structure of Western consciousness something of the plasticity, effortless ability to transform and variety that comes from bringing state experience to bear on all that we do. 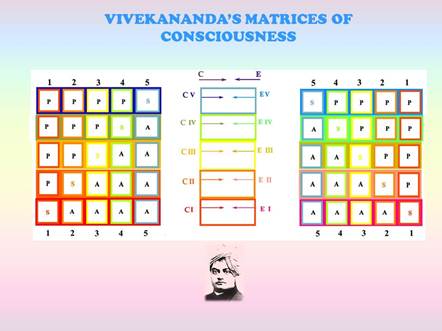 Here we see the ontological fields of Integral Vedanta on the vertical axis and on the horizontal axis the names of the five state-stages of consciousness Vivekananda accessed during his training. I visualize the basic process as states moving horizontally across and intersecting the entire array static fields in the sequence 1 – 2 -3 – 4 – 5, i.e. from the waking state to the non-dual state. 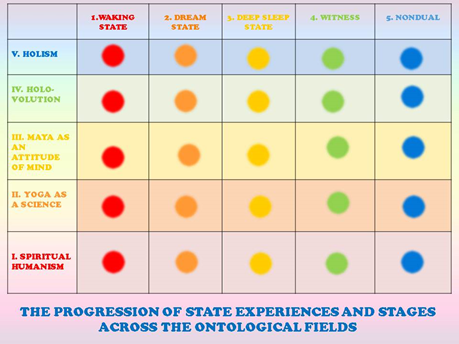 From my analysis of the data, this state-stage progression along the ontological fields is what actually happened—of course, in each of the twin fields. in which the spectrum of conceptual context in the ontological core is progressively filled out with the gamut of experiential content, creating a total of fifty cells of unique context/content and resolving any counterintuitivity or complementarity both horizontally, vertically, and diagonally. 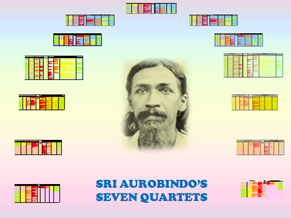 Aurobindo gives us seven quartets, in both sides of each of which there are four stages of exegesis, whose content corresponds with that of the state-sages in the Integral Vedanta matrices. Integral Vedanta provides us with actual, historical data of what happens in such a system; with, of course, the more contemporary understanding that the event occurs within twin matrices of combined conceptualized context and experiential content. A fourth commonality in the models of Vivekananda and Aurobindo is their central emphasis on vijnana or integral consciousness. Vi-jnana means literally greater knowledge, but it is necessary here to see just how our two acharyas understood the word that was so key to their models. [Turiyatita] is really the last and the supreme state of the Self. You not only find this state in samadhi, but in each and every activity of the world. This last definition underlines explicitly that vijnana or turiyatita enables one who has realized it to be involved directly in all possible levels of the world and to remain untouched by them, no matter how deep and unwavering his or her commitment is to such involvement. Vivekananda’s entire life and work is an exemplification of its meaning. Aurobindo explicitly and frequently states that the whole array of levels and interrelationships between them—from the physical body to vijnana itself—appear and behave as they do only when the “operator” is directly plugged into the vijnana state itself. Finally, both Vivekananda and Aurobindo prioritize above all other mantras Saccidananda: Existence, Knowledge (Consciousness), Bliss. In Raja Yoga and other works, Vivekananda begins by stating that the previous paradigms of Purusha and Brahman are now to be thought of as Existence-Knowledge-Bliss. At the same level in Synthesis of Yoga, Aurobindo states that Saccidananda is not simply a state of calm, but an awareness of creativity and infinite delight in universal things. At the second level, Vivekananda’s formulation is that Saccidananda is not made up of separate entities, but is the essence of the Atman , echoed by Aurobindo in the term three inseparable divine terms. 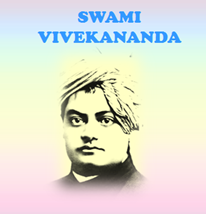 At the third level Vivekananda’s view is that Saccidananda pervades all. of the conceptual levels, echoed by Aurobindo’s vision of an ascent of transcend and include from plane to plane. At the fourth level Vivekananda speaks of Saccidananda as a kind of cosmic template that applies all the way through the entire range of consciousness and manifestation. Aurobindo “responds” with the idea that whatever circumstance we may be in, we see them all as outpourings of essential consciousness and delight. At the fifth level Vivekananda discusses how the human individual is capable of expressing Saccidananda in its entirety through any and all of his or her actions, thoughts or insights. Aurobindo points out that we have to become the Purusha, Sat-Chit-Ananda, delighting in a divine individual possession of its Prakriti and no longer mental beings subject to our egoistic nature. I read this as meaning that any dichotomy whatsoever is completely resolved and the corresponding release from the limitations of ego in the individual human being is complete and permanent. As before, we tend to see Vivekananda’s view as more one of principle, and Aurobindo’s as that of addressing all of the problems that arise in the trajectory of an evolving individual. But both acharyas are giving very similar insights into what both of them quite clearly regard as the algorithm or operating system of the whole picture of consciousness. Debashish Banerji. 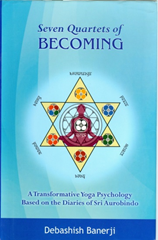 (2012).Seven Quartets of Becoming: A Transformative Yoga Psychology Based on the Diaries of Sri Aurobindo. Los Angeles: Nalanda International. Nirodbaran, Vol. 1, p.164. From a "note kept by Anilbaran of a talk with Sri Aurobindo in July 1926" [10 July?] as quoted in an addition from the Editors in Nirodbaran's Talks with Sri Aurobindo. Historically this is not unique to Indian systems. Even as far back as the eighth century Sureshwaracharya, Shankara’s disciple, was positing that there could be horizontal state progressions of this nature within states themselves. The Kashmir Shaivites carried this forward into actual statements of what the content of each cell would be in such a progression. When that Knowledge Absolute becomes limited we call it intuition, and when it becomes still more limited we call it reason, instinct, etc. “Sankhya and Advaita” in Vedanta Philosophy: Jnana Yoga, Part II; Seven Lectures by Swami Vivekananda. New York: The Vedanta Society, c1907, pp.83-84 (CW, Vol.2: Sankhya and Vedanta, p.459). Synthesis of Yoga, Chapter XIX: the Nature of the Supermind, p.786. Lakshman Jee. (1988). Kashmir Shaivism. Delhi: Sri Satguru Publications, p.83; italics mine. I established this fact for Vivekananda in my compilation of his quotes on the Vedas, Upanishads and Bhagavadgita, where he comments profusely on all of the major mantras, but gives total pride of place to Saccidananda. In each of which the Purusha-Prakriti dichotomy is held in a resolution. This idea is developed in MacPhail, Jean C. (2-13) Learning in Depth: A Case Study in Twin 5x5 Matrices of Consciousness. Presented as a doctoral dissertation to the Department of Cultural Studies at the University of Viadrina, Frankfurt on Oder, Germany. http://opus.kobv.de/euv/volltexte/2013/83/pdf/MacPhail_Learning, pp.332-333.